The rise in popularity of USB 3.0 has enabled a large number of high-speed bus-powered storage devices. Flash drives and external SSDs can take advantage of the high-speed nature of the interface. They have slowly been increasing in capacity too, and we even had a 1TB portable SSD from Samsung earlier this year. Unfortunately, the cost per GB is still too high for the average consumer. From the perspective of that market, bus-powered external hard drives (2.5") are hard to beat. 2TB USB 3.0 drives have been around for some time now, but the 4TB mark in the portable 2.5" form factor had only been achieved with dual drives and external power. Seagate recently launched the Backup Plus Portable 4TB USB 3.0 drive based on one of the first 4TB 2.5" drives in the market. The Backup Plus Portable 4TB USB 3.0 drive internally carries a Seagate/Samsung Momentus ST4000LM016 drive. Information about this drive is currently sparse on Seagate's website. Suffice to say that this drive will not fit most notebooks (it is not thin enough). User reports based on the raw drive indicate that the thickness comes in around 15mm, which should be OK for NAS units and other applications. 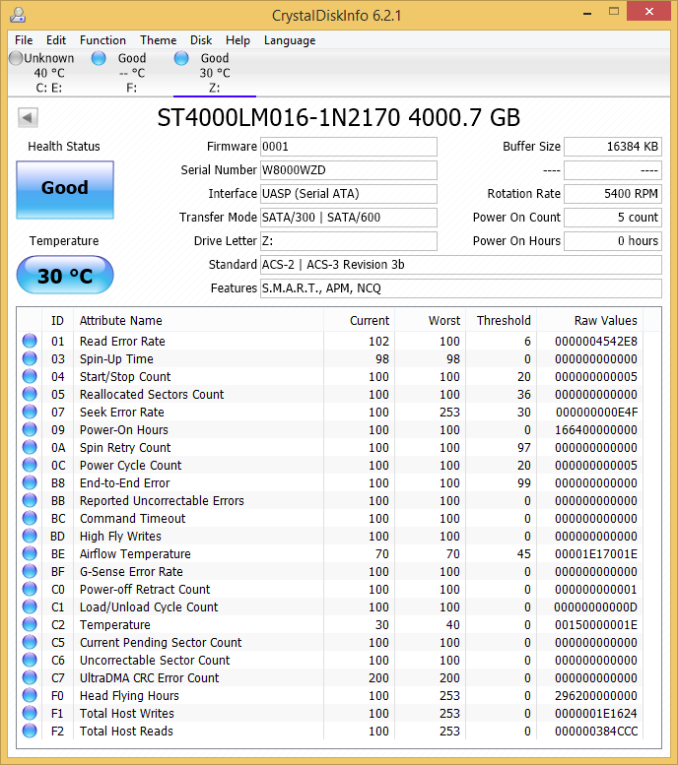 In any case, CrystalDiskInfo provides a lot of information about the internal drive. It appears that the ST4000LM0016 uses five platters with a 800GB/platter design to achieve the capacity point. The USB 3.0 bridge chip also supports UASP and S.M.A.R.T passthrough. The unit has dimensions of 114.5 mm x 78 mm x 20.5 mm and weighs 541 grams. It comes with a USB 3.0 Type-A male to USB 3.0 micro-B male cable. As portable hard drives become more and more of a commodity, vendors are attempting to put in value-adding features to the product. The Backup Plus Portables comes with 200GB of OneDrive storage valid for two years. In addition, we also have the ability to connect the unit to the Lyve app that provides photo / video management in the cloud. It also comes with a basic backup configuration software in the form of the Seagate Dashboard. We will be taking a brief look at these value added features after discussing the benchmark numbers. 1. Sometimes even these old, slow spinners get lucky with a cached file or something, and that extra overhead can satisfy a short burst of throughput that would otherwise be lost. 2. There are more benefits to using the newer controller than just throughput. Personally I don't trust a 7200RPM drive "locked in a cage." 5400RPM drives are much less prone to thermal runaway when being hammered with a few TB of data over a short period, say, during an initial backup. To combat this, manufactures have introduced very aggressive head parking, which causes wear in other areas of the drive. This data cane be seen on the first page under load/unload count 0000000D (which is 13) for a drive that has only been powered on 5 times and has less than an hour of use. Many of these 2.5" drives are rated at low as 100,000 load/unload cycles but some are rated as high as 1,000,000. So even though the 5400RPM drive will inevitably last longer due to better thermal performance and less inertia when "banged around" eventually the loading ramp will fail and cause physical wear to the heads or the platter edge.